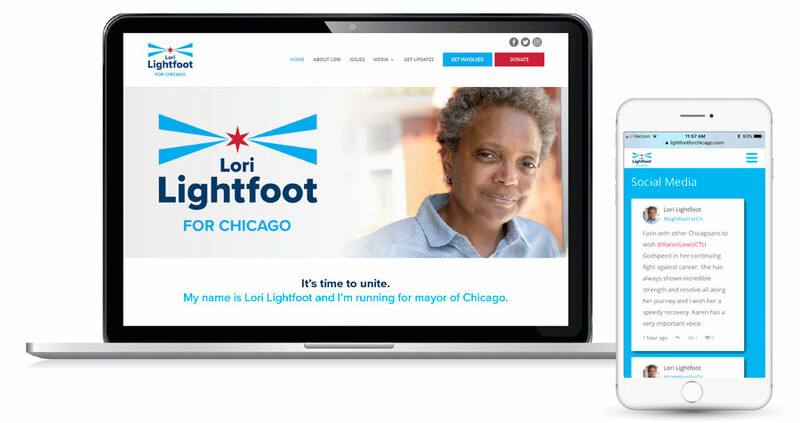 Synergy is honored to be engaged to create the identity for Lori Lightfoot’s campaign for mayor of Chicago 2019. After meeting with Lori and her team, we began the process of creating a platform that captures the passion and progressive leadership she brings to the race. Inspired by a beacon of light, the logo we created reflects her ability to shine a light on the issues facing Chicago. Lori Lightfoot is one of nine candidates who have declared they will run against incumbent Rahm Emanuel. If elected, she would be the first African-American woman to serve as Chicago’s mayor, and the first openly LGBT mayor of an American city with more than two million residents. Lori Lightfoot’s values were shaped as a young woman. Her parents overcame obstacles and worked multiple jobs to provide for their children. She learned the value of education and hard work and paid her own way through college. Lori later became a federal prosecutor and the first African American woman to serve as President of the Chicago Police Board, where she has been a forceful advocate for bringing accountability to the police department, working to rebuild trust between officers and the communities they serve. Impossible to ignore at 5’1”, her stance remains fierce and forward thinking as she focuses on changing the us vs. them way of thinking. Lori believes that Chicago cannot reach its true potential until all of its residents have access to opportunity, so she will make equity and inclusion the cornerstones of her governing philosophy and policy-making. Her campaign will build a coalition to unite progressives, the LGBTQ+ community, people of color seeking criminal justice reform and safe neighborhoods, good government reformers and public education advocates. To learn more about Lori’s vision for Chicago, check out lightfootforchicago.com. And be sure to check out the Lori Lightfoot feature in this month’s Marie Claire.